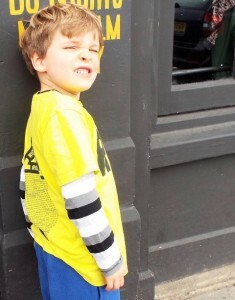 Atticus ‘wears whatever is put out for him style’ HOT Style-Seeker, Claudine Eccleston, reports. I live in Hastings up there, West Hill. He points upwards like a superhero. Atticus is still quite young, so he gets his clothes from his parents and his grandparents. 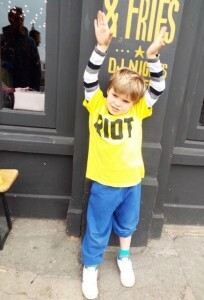 His dad is so excited that he got his T-shirt from the charity shop for 50 pence. “Imagine, 50pence! 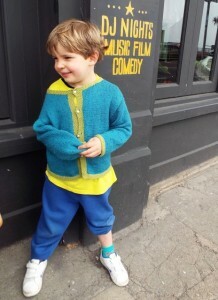 !” Dad said the socks and trousers were from H&M and they were free. If you take your unwanted clothes in, they give you a voucher to spend. It was tricky talking with this very stylish young person. It became clear that he had better things to do. He enacted several scenarios that only can be interpreted by a parent. His style would definitely, as far as I could see consist of superhero somewhere along the line. Atticus informs me that he likes Asterix and running around and climbing. Did I say that Atticus has absolutely no interest in clothes. He simply puts on whatever is put out for him at the time. He is however, very keen to show us just how gorgeous and handsome a boy can be in his very unique, flung together style and fashion. Check out the cardigan. Hand knitted by his uber talented grandmother, Jane.